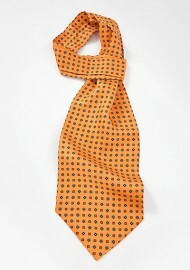 The ascot is a type of neckwear that resembles a cross between traditional necktie and scarf. In recent years the ascot has once again become quite popular and we therefore recently added a selection of formal and casual ascots for you. Click on your favorite ascot tie below to see a larger image and to read about how to match it.